If you are an Evernote user you can email notes directly into your Evernote account without having to copy/paste the information into the web interface or the application on your computer. For example, I forward all membership information that I get via email to my Evernote account. By using the information below I am able to tell Evernote which folder and tags to give the note. You first need to find the special email address in your Evernote account. Using the Evernote website you can find this address in the Settings section. At the bottom of that page you will see a box that says Emailing to Evernote where you will find your unique Evernote email address. It will look something like [username].12345@m.evernote.com. You can find the same information in the Account Info on the desktop client, or in the Sync tab on the iPhone version of the software. Save that address in your email’s address book and you will always have it handy. Be aware that anyone is able to send an email to that address; therefore, it is not something you want to share freely. If the address does get compromised you are able to reset it without effecting previous notes sent through this method. The subject line of the email you send is where the magic takes place. Title: At the beginning of the subject line you will give your note a title. This can be anything you wish as long as it does not contain the symbols @ and #. Notebook: After the title you will type @NOTEBOOK-NAME. This will be the notebook that your email should be added to. This has to be an already existing notebook. You cannot (currently) create a notebook using this method. Tags: Following the @NOTEBOOK-NAME you will then type #TAG. If you want to tag it with several tags, then use a # at the beginning of each tag. You also cannot (currently) create new tags using this method. 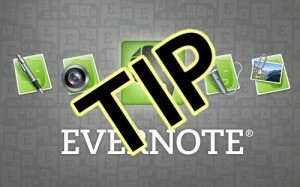 This creates a new note titled Evernote Tips for Missionary Geek in the notebook called blogposts. It will be tagged with the tags mgeek and ideas. If you don’t specify a notebook, or you mistype the notebook name, the note will be added to your default notebook. Nothing gets lost if you accidentally mistype tags either. The tag name that you give will go at the start of the note so that you can tag it appropriately later. Notebook and tag names are not case sensitive. Bonus Tip: You can send Twitter messages to Evernote as well. Start by following @myEN on Twitter. They will send you a Direct Message (DM) containing a link to connect your Twitter account to your Evernote account. Once it is set up you can add @myEN to any Twitter message and that message will be added as a note into Evernote. You can also send DMs from your Twitter account to @myEN and the note will go into your default notebook without it being publicly viewable through Twitter. Here is more information on how to use Twitter and Evernote together. Thanks for the information, I love Evernote and I use it religiously. It took me a while to understand how Evernote can help me in my ministry, but once I started using it I have found many ways to use it more. thanks for this tutorial.. I will use email to ever note more often. You are welcome! I am glad it helps.